This wideband no-tune FM broadcast band amplifier unit was developed to supplement the PCI MAX line of fm transmitters, but will work great with any LPFM (low power fm transmitter) on the market. It takes the signal and amplifies it to the full power of 15W. It can also be used to extend the range of stronger small transmitters, up to about 1W of output power (amplifier's sensitivity can be adjusted with jumpers). No tuning is required as the amplifier is a fully wideband design. It also features a built-in SWR foldback protection with 10-LED bargraph display. Unit works from a stabilised DC mains power supply (12-15V at 3A) or car battery. The manual for this unit can be found here. Here and here are two small movies to show how it all works. Its best to save it to hard disk and than play with VLC or Windows media player. 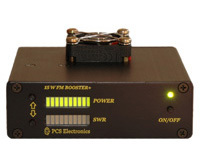 Our Cyber Max Micro test unit was used to drive the 15W booster+. A dummy load was attached and Daiwa CN-101L SWR/POWER meter . 15V power supply was used to power the booster. - RF Output Power: Adjustable from 0 to max via up/down keys. - Spurious/Harmonic rejection: Harmonics: > 50dB min.